An understanding of the ‘lie of the land’ before you start a ‘realist’ landscape painting is important. By ‘lie of the land’ I mean the hills and hollows in the fore and middle distance of the scene to be represented. If the surface is flat the rules of perspective can be applied without major problems. Whether you sit in front of the scene, or a photograph of the scene, and paint what you see, the same issues arise. Hills can look like hollows and vice versa, rivers appear to be flowing up hill etc. If you look at the initial construction lines in the accompanying video you see that I have drawn the 2 pathways as standard converging lines meeting on the horizon. The shape of the bridge was placed on top of this ‘generic’ path. The depression of the river bed (front left) was ‘hung’ on the same flat construction the bridge was placed on. It is much easier than trying the ‘hit and miss’ approach. As you can see in other posts, I use the same approach in most landscapes. Almost like creating a grid according to the rules of perspective and putting the scene on top. 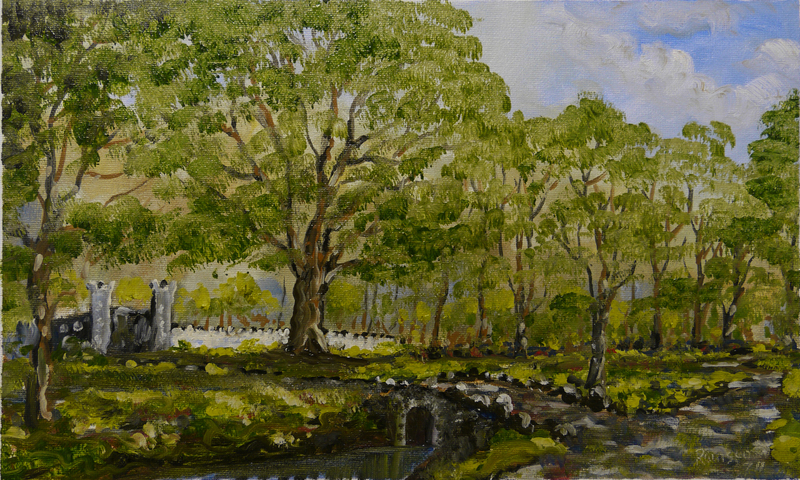 This entry was posted in Oil Painting and tagged Art, Oil Painting, Oil Painting Instruction, Time lapse painting. Bookmark the permalink. My daughter is an artist in San Francisco. Her blog led me to your site, as she referenced your great instructional work there. I love your work. I have a particular love affair with trees, and if you will, Maxfield Parrish “lights”. Something very magical about the same tree, viewed in all the different seasons and different lights. Thank you for your comment. “I think that I shall never see. A poem lovely as a tree”. This sums it up nicely.